Android Reborn – Do you like listening to music from your Android? If you do, you must have lots of songs stored in it. To make things easy for you, the default Android music player does a very good job in organizing and ordering the music. That being said, sometimes there is still incomplete information as well as missing album art from it. So, let me tell you how to change and add album art on Android here. In order to change and add Android’s album art, you will need the help of certain applications do the job for you. Of all applications for it, we suggest you to try iTag app. This is one easy app to use on Android to help you change or add the album art. There is no need to get confused looking for others if you can do well with this application we recommend to you here. Don’t you want to try it? It requires only simple procedure for you to follow, actually. Here are the steps then. 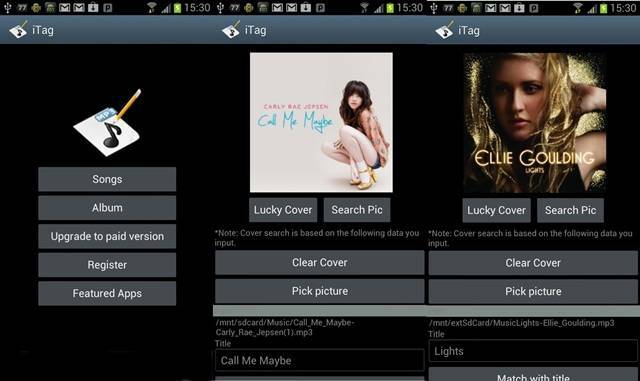 Download iTag – Music Tag Editor from Google Play Store. Install and launch it from your Android. Choose on the song which art you want to add or change it. Tap on clear if you want to erase the current art. Tap on Pick Picture and select the art you want. Then tap folder icon on top right corner to save it. That way, you should be able to get your songs packed in the album with correct or desired art. See? It really is a piece of cake to add or change album art on Android with this application. This way too, the music albums on your Android will be so well organized and ordered. For music lovers, this should be the thing they would want to get after all. Are you one of them then?